When buying a house, car or boat, it’s easy to get lost daydreaming about your new purchase while glossing over the financial details. August’s Wealth Management Insights looks at some of the monetary factors you should consider before writing out that check. Buying a house – the largest purchase most people make – warrants careful planning. When deciding whether to buy or rent, look beyond the sticker price. Factors such as the freedom to renovate and your financial health should also be considered. While renting a house or apartment may have a smaller upfront commitment, buying lets you build equity in an asset. Don’t buy more than you can afford. According to Zillow.com, your mortgage should generally not exceed 28% of your monthly income. Also, plan on spending 3% of your home’s value annually on maintenance. Selling your old home to buy a new one? You may be able to exclude up to $250,000 ($500,000 for a couple) of that gain in income from your taxes if certain IRS ownership and usage criteria are met. Need a new set of wheels? You don’t have to pay cash for a new car right off the lot. Buying used. Used cars are more reliable than ever, and a late model car can save you up to 30% over new. They may also require more maintenance, so expect to spend some of those savings on upkeep. Leasing. 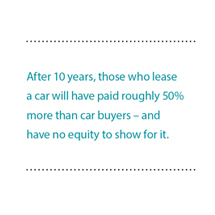 According to Edmunds.com, if you’ll need a car for less than five years, leasing may be the smarter option given its fewer upfront costs. At about five years, the cost savings start to shift to car buyers, who will pay less in insurance and eventually stop making monthly payments. Getting rid of your old car? Although you may not get blue-book value, trading in your old car is often the simplest solution. Donating it offers certain tax and philanthropic benefits, but know that the IRS has tightened rules surrounding “fair market value,” and according to Charity Cars Inc., as little as 5% of donated vehicles actually go to people in need – most are auctioned or go straight to salvage. Heeding the call of the open waters? Poor preparation could leave you high and dry. Not all boats are the same. Bowriders can be great for towing water skis but usually lack cabins for overnight guests. Flat boats maximize deck space for fishing but leave less room for seating and accommodations. Be sure your boat is right for your needs. Larger boats can be more expensive to run and maintain. Make sure yours has only the features you need and is the right size for how you’ll use it. Note that vessels with a beam greater than 8’6” can be trailered only by special permit. Used boats are an option; however, it’s harder to learn the maintenance and accident history of a used boat than a used car. A marine surveyor can help determine if a used boat is seaworthy and well-priced. Once you’ve decided on your purchase, then it’s time to consider your payment options, where factors like credit score, down payments and closing costs can come into play. 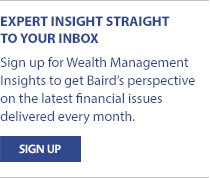 Your Baird Financial Advisor can provide guidance so that big purchase doesn’t leave a big hole in your finances.